We asked you to tweet words of support to Steven Gerrard and we received messages from all around the globe! The Liverpool Echo have always followed the career of dedicated Liverpool Football Club captain Stevie G.
So it was only fitting that they do something big to say thank you to him for his service after he announced that after 27 years at Liverpool Football Club he is set to leave Anfield to begin a new path with LA Galaxy. 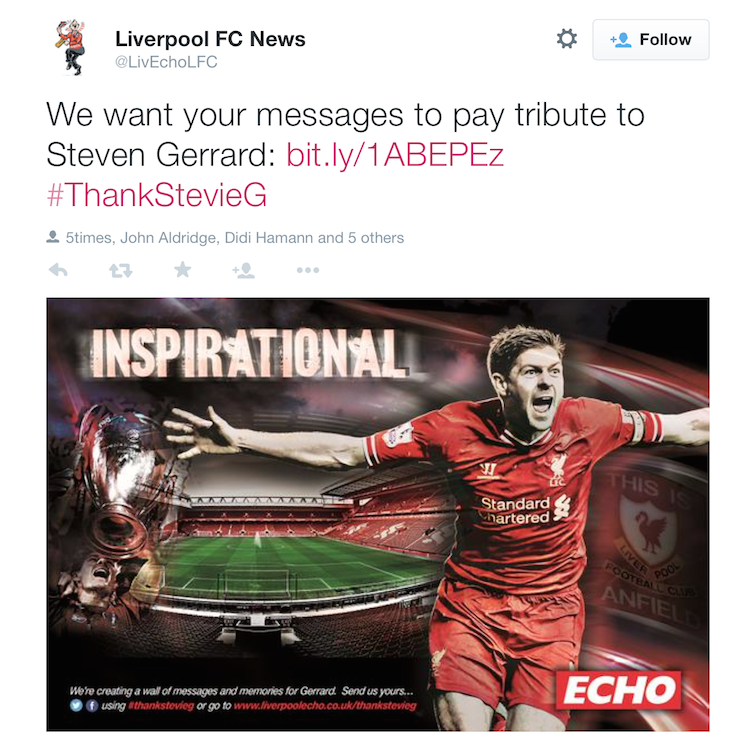 The Liverpool Echo, who are long term clients of Street Advertising Services, wanted to collaborate with our artists to create something meaningful which would give Stevie G fans a voice and also raise awareness of their brand. 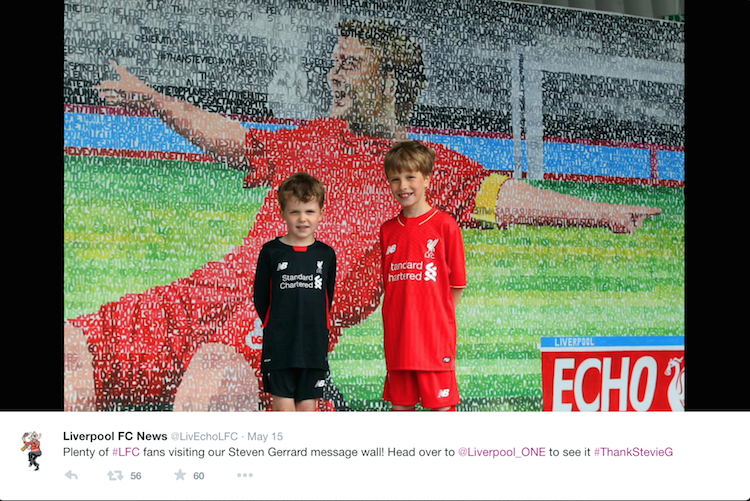 The #ThankStevieG hashtag was born and messages starting rolling in from not only the UK but all over the world! We installed a 8m x 4m Gerrard Wall in Chavasse Park LiverpoolOne and our artists started live painting the hundreds of heart felt messages onto the canvas. 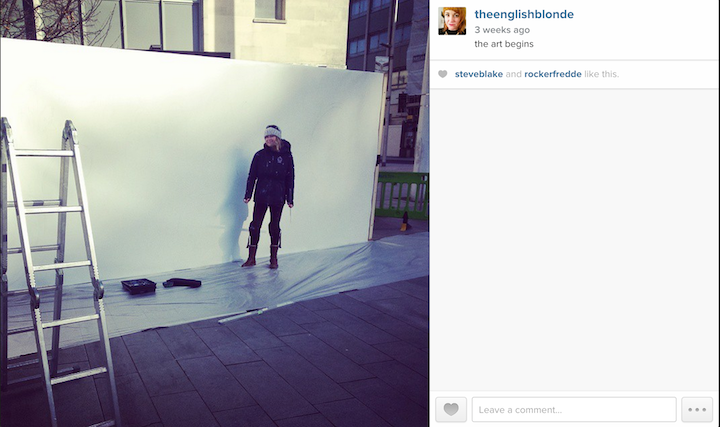 Fans and passersby alike were able to admire the piece of art as it progressed and took form throughout the week. 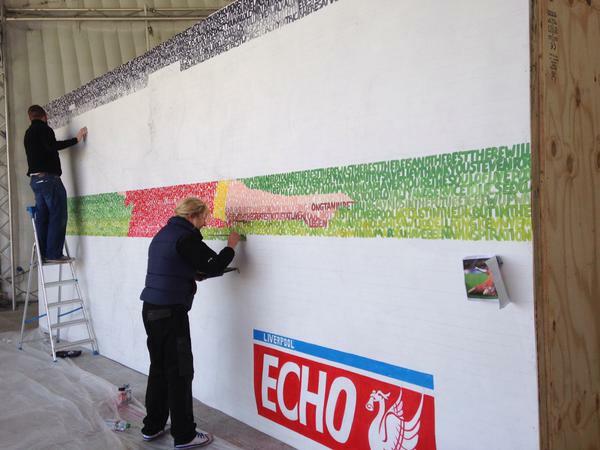 Contributors showed up to search for their own messages of thanks on the canvas and the Telegraph and Sky Sports both covered the campaign. 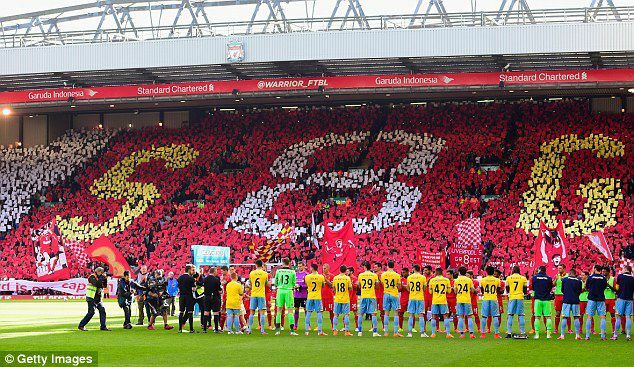 The finished product was very impressive and was even displayed in the VIP section in Anfield for Stevie G and all the other players to admire. There are several great reasons to incorporate a message wall into your campaign. Firstly the medium can actually hold some meaning. 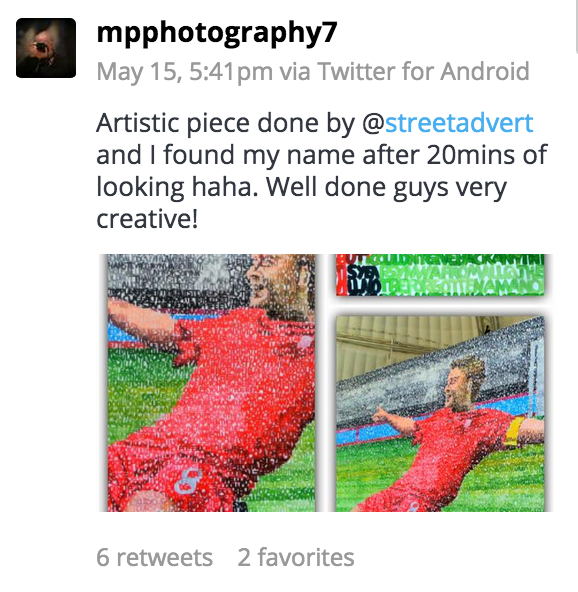 Steven Gerrard meant a lot to Liverpool fans and this comes across well on the artwork we created. If you are looking to devise a campaign that has a little heart then this is the right method for you. 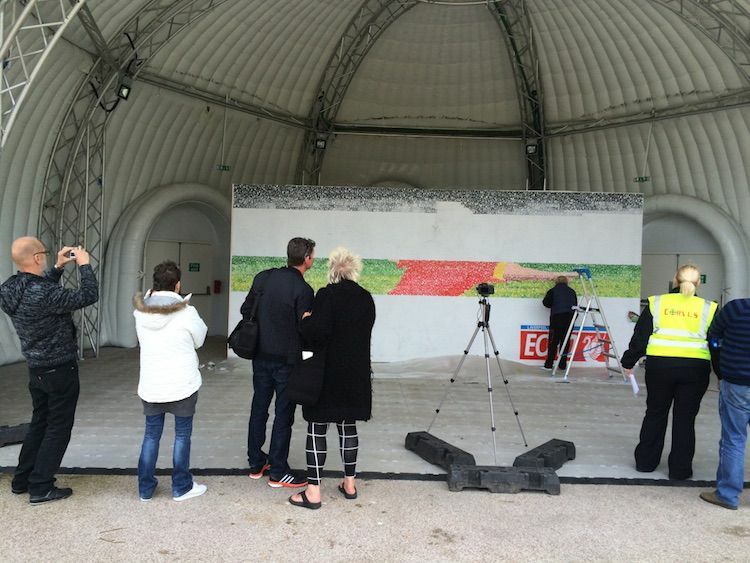 Secondly the message wall can be use to develop the intrigue of the public over the course of one or two weeks (depending on the size of the canvas) It is interesting to see the artwork transform from just words on the wall to a complete image. Lastly the message wall is highly sharable on social media and this can also be linked with a tour of the finished product. This medium can be used to highlight almost any issue or showcase any type of brand. Street Advertising Services previously completed a campaign for My Journey Hampshire. This message wall was to get people out of their cars, off public transport and onto their bicycles! 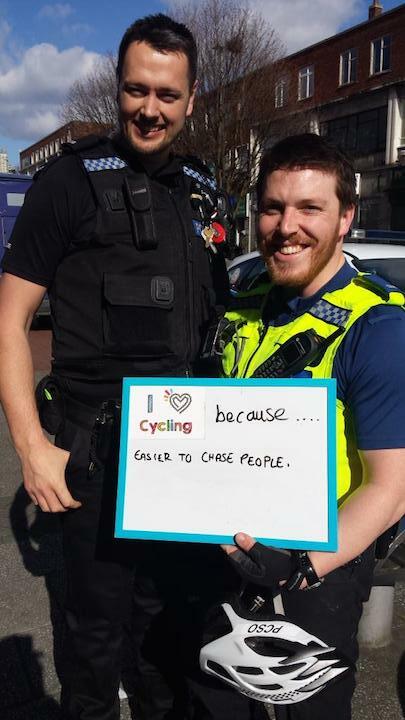 Our team went out onto the streets of Southampton to find out exactly what it is that people love about cycling. This campaign was integrated with other methods such as Chalk Advertising, Clean Advertising and Projection Advertising. We started off with a blank 6 by 3 meter message wall and over the course of a week and after an intensive social media campaign managed by our team at Street Advertising Services we ended up with a fab message wall. 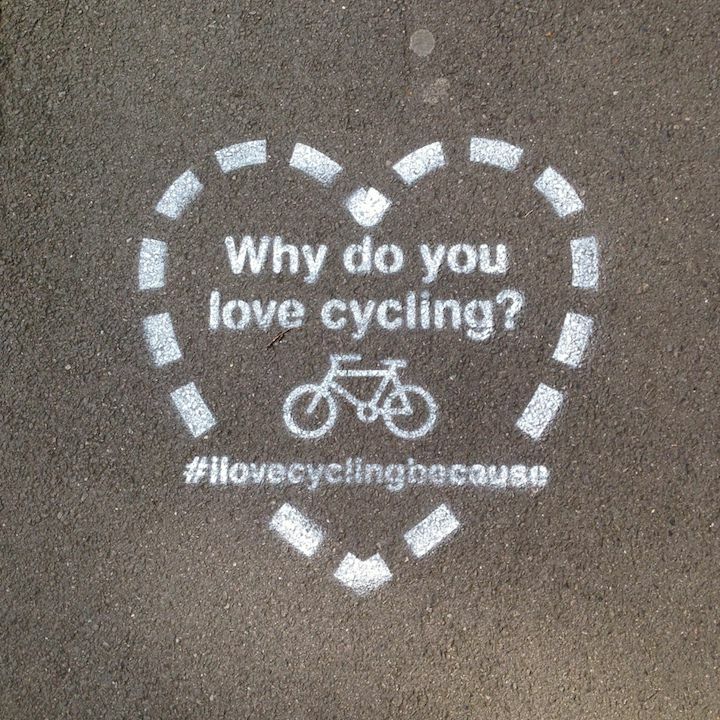 We had such great responses from passersby and more and more people wanted to contribute their love for cycling. 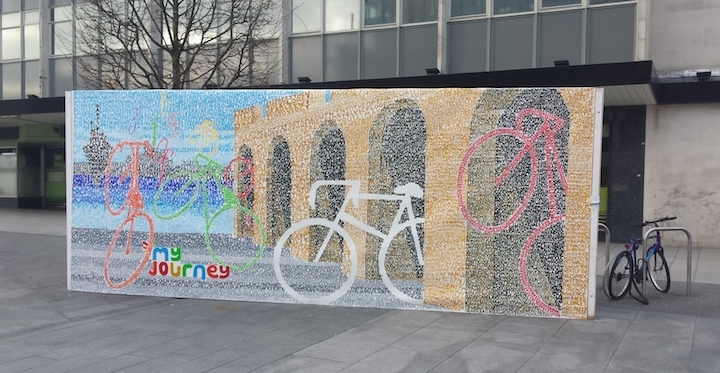 Our cycling message wall became such an attraction in the Guildhall Square that the local press covered its progression and we even had a few blog entries dedicated to the campaign. So what is a message wall? It is a bespoke piece of art created from the words of your audience. A way to tell a story, involve your audience and create something meaningful, lovingly created from organically collected messages or collected by inviting your audience to interact by using a specific hashtag on Twitter. Up close it’s a good read! From a distance it transforms into something entirely different! Why should you choose a Message Wall for your campaign? It provides an organic way to interact with the public and leaves a huge impact! It is creative, interesting and It can be any size, any shape and any design! Plus we can build your wall anywhere! A message wall is an opportunity to create something unique and meaningful where everyone can get involved and It is perfect for social media interaction. So what are you waiting for? Get in touch with our team now and let us help you to turn your brand message into a bespoke piece of art.